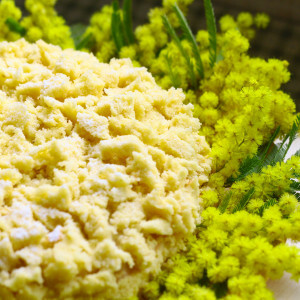 The Mimosa cake is a sweet and elegant confection usually prepared on International Women's Day, 8th March. It is a simple sponge cake stuffed with whipped cream and decorated with sponge crumbs from the same cake to obtain a ‘mimosa flower’ effect. Modern versions of this dessert, like ours, require the addition of fruit to taste, especially pineapple. We like pineapple because it gives a lightness and freshness to an otherwise slightly plain cake. To prepare the Mimosa cake you need a little patience and some expertise in cutting and trimming. So, find yourself couple of hours of peace and quiet and settle down to some cake-making. The result will be highly satisfying! Prepare a 28 cm cake tin, mix the ingredients and bake at 180°C for 30 minutes. Let it cool. Meanwhile, prepare a custard: whisk the egg yolks with the sugar, add the flour and cornflour, the finely grated lemon zest, and whisk in the warm milk, then return it to the heat until just before boiling point. Remove from the heat and let the custard cool. Whip the cream until stiff. Cut the pineapple into cubes and get the icing sugar ready. Take the now cooled sponge cake, cut off the top surface, and then cut it again in two horizontally. Trim the edges. Take one of the two larger cake halves and break it into crumbs and set aside. Take the second of the two big cake slices and soak it with the pineapple juice. Mix the custard with the whipped cream so as to obtain a ‘Chantilly’. Spread some of this cream mixture onto the cake, add the pieces of pineapple, and then spoon over some more of the Chantilly. Cover with the smaller slice of cake. Take a knife and trimmed the edges of the cake so they are very neat. Spread the entire cake, including the edges, with the remaining whipped cream mixture. Then put all the set aside crumbs over the top and side of the cake. Decorate with icing sugar and a few mimosa flowers. If children are not going to eat your cake, you can further add ‘maraschino’ (sweet cherry liqueur) to the pineapple juice. This will give further character and flavour to your Mimosa cake. The Mimosa flower is a symbol of International Women's Day on 8th March because this plant usually blooms during the first days of March.